The colored section of this picture is the central region of NGC1433. 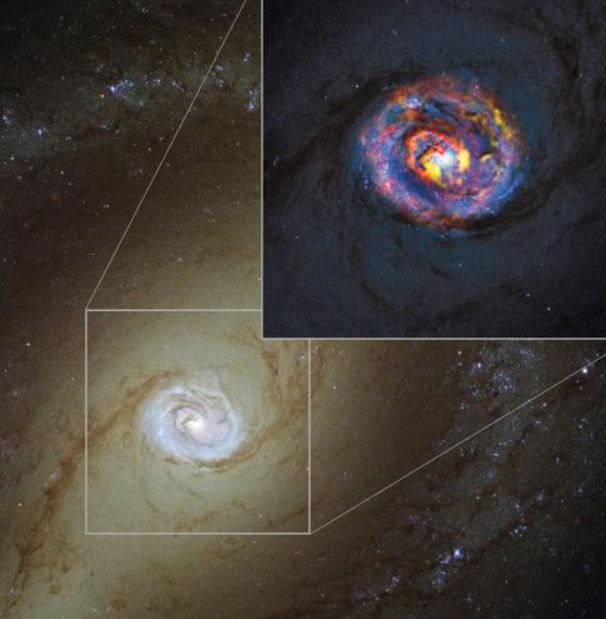 The colors show gas outflows from the core of the galaxy as imaged by the ALMA millimeter / submillimeter telescope. NGC1433 is an active galaxy (Seyfert) that has a double bar. The bar is surrounded by a ring from which two major spiral arms spread out. Within the nuclear region, ALMA found a smaller spiral structure where streams of gas emerge from the galactic core and connect to two major arms that have spread out from the core. Photo credit ALMA (ESO/ NAOJ /NRAO) / NASA / ESA / F. Combes. Verse twenty contains two compound (hupotasso) verbs. Hupo means under and tasso to arrange in an orderly manner. Polybius used hupotasso to describe how Roman soldiers were subject in an orderly manner under their officers. The Romans often triumphed because their soldiers carried out their orders instantly, which allowed them to charge at the right moment, perhaps to outflank the Greek phalanx. The first hupotasso verb in verse 20 is passive. When God cursed the ground and the animals in Genesis 3, he did so with passive verbs. He commanded nature to degenerate on its own. He did not actively ruin the creation by creating thorns and thistles. For example, on the day Adam ate the forbidden fruit, the Hebrew states “dying he would continue to die.” He lived for 930 years before his mortality returned him to the dust. Even today, dying is often a process, rather than just an event for many old people. The second hupotasso verb is an active infinitive. The creation is actively obeying, in an orderly manner, the command to inutility. Paul says the creation is presently enslaved to change (phthora). The Greek philosophers used phthora for change that does not destroy that which is changing. In verse 22, Paul says we know that the whole creation groans-together and suffers-together until now. Paul’s emphasis on orderly deterioration and his together-verbs suggest that everything is changing relationally. No aspect of something that changes relationally is unaffected by the parallel, orderly change. No one in Paul’s era could imagine unchanging atoms, which are the basis of modern second law interpretations of this passage. Western science cannot countenance matter flowing out of a point source, spreading out into a huge, galactic growth spiral. Why not? Science was built on an elementary assumption that presupposes that matter is not changing relationally. When the Greek philosophers tried to invent science, they struggled with the issue of change. Aristotle wrote, “And again, because they saw that all this world of nature is in movement and that about that which changes no true statement can be made, they said that of course, regarding that which everywhere in every respect is changing, nothing could truly be affirmed.” If everything is changing, all theories will fail because “what is” eventually becomes “what is not.” In Aristotle’s day, people could not imagine unchanging matter. Indeed, Aristotle thought matter’s form grows like a baby in the womb. He understood that things have stability so he imagined that an underlying, invisible thing (that he called hypokeimenon) does not change. 1500 years later, medieval friars discovered Aristotle’s books and translated them into Latin. In their efforts to make Aristotle’s philosophy fit their religion, the scholastics used nouns derived from the Latin verb to be : “being and essence.” The western system was founded on the idea that the essence (what substances intrinsically are) does not change. It was upon this assumption that later scientists contrived their definitions of time, mass and energy; their empirical measuring and their mathematical laws of physics. The Apostle Peter predicted (2 Peter 3:3 – 6) that in the last days mockers will come claiming all things remain the same. They will obfuscate the evidence that the plural heavens are out-old (Greek ekpalai). Indeed, modern scientists speculate that 80% of the matter in the universe is invisible. Why? Because none of their mathematical laws work in the distant universe. They imagine that 70% of all the processes in the universe involve the stretching of the vacuum of space time. Supposedly, the vacuum of space time stretches all light traveling through the void. They claim stars accreted from space dust when visibly we observe them emerging and spreading out from the minuscule cores of countless ancient galaxies. They must obfuscate because their structured, mathematical system was contrived on a single idea, the one the Bible predicted for the last days. He commands us to lift our eyes and see how He calls the stars to come out in unbroken continuity, so none go missing. He spreads out the plural heavens in unbroken continuity like a tent to dwell in. We see the only history that is visible as it happened, cosmic history. We observe how billions of galaxies continue to receive form, growing out of their primordial formless beginnings. Billions of galaxies grew into huge, star-filled growth spirals, which confirms a literal biblical creation. Some wag might claim, the biblical universe is supposed to be only 6,000 years old. Please observe the universe. The atomic clocks continue to accelerate as the star streams also accelerated outward. According to Moses, God continues to form the Sun, Moon and stars and continues to place them in the spreading place (Hebrew raqiya). Cosmic history reveals the stars continuing to form and spread out as billions of galaxies grew from formless beginnings to huge, local, dusty growth spirals. The atomic clocks accelerate as the star streams also accelerate outwards. 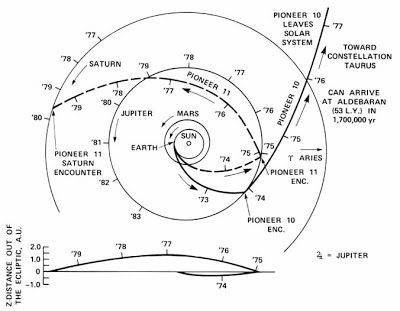 The spin stabilized Pioneer 10 and 11 exited the solar system in opposite directions. Their transponders locked onto radio signals (derived from hydrogen maser atomic clocks on Earth). The spacecraft multiplied the received signals by a fixed ratio and transmitted it back to Earth. When NASA compared their own clock signals sent out hours ago with the returned signals, the signals kept changing frequency with distance. Evidently NASAs atomic clocks were changing frequency. The graphic is from NASA showing how Pioneer 10 and 11 exited the solar system in opposite directions.